Be quiet! 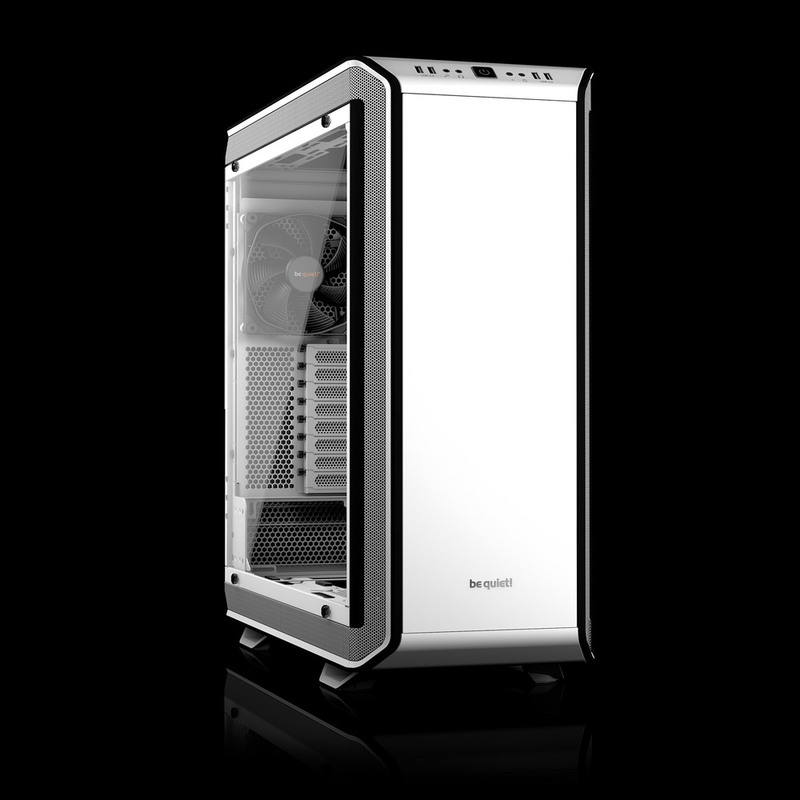 have introduced a flagship case designed to hold any system, be it air-cooled or water-cooled. In 2016, they launched the original Dark Base 900. 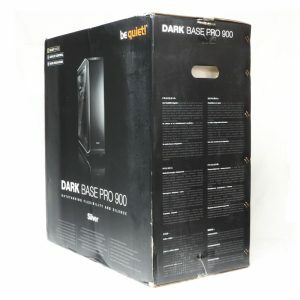 The Dark Base 900 Pro is the latest version is the newly launched product. It has a piece of tempered glass in place of a standard side panel. 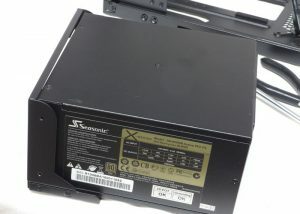 It also contains LED strips to light up your system. The black color case has three trim colors – Black, Silver, Orange. 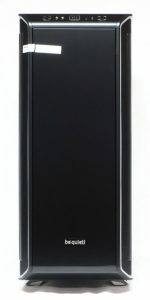 The all-white case comes black trim only. 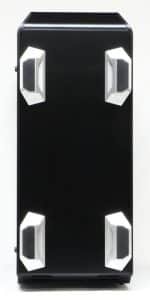 The picture below shows the case wearing silver highlight pieces. This is a big complex case. Is it all worth it? Let’s dig in and see! Click on the image to get the original (enlarged) view. The Dark Base 900 is a heavy case. It ships in a simple retail box, with lots of photography and marketing points all over the box. But I had to enlist an assistant to help me. She stood on the bathroom scale while I weighed her and it, weighed her without the case then subtracted. Case and packaging weighed 45 lbs in the box. When we took it out we were faced with a quandary: the Dark Base 900 was clothed in a fashionable black paper cloth while its end caps are foam white. Cases usually come with a white plastic bag and white Styrofoam end caps. That makes taking pictures easy: just get out the black background. 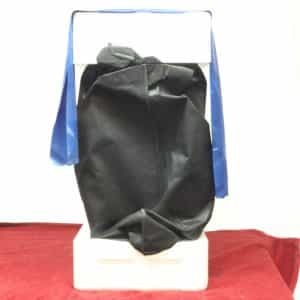 That wouldn’t work here, and I can’t find a just-right color for a background, so I sat the bottom end cap on a colored towel and draped a rubber PT strip over the top. This gives you a sense of the padding this case has. 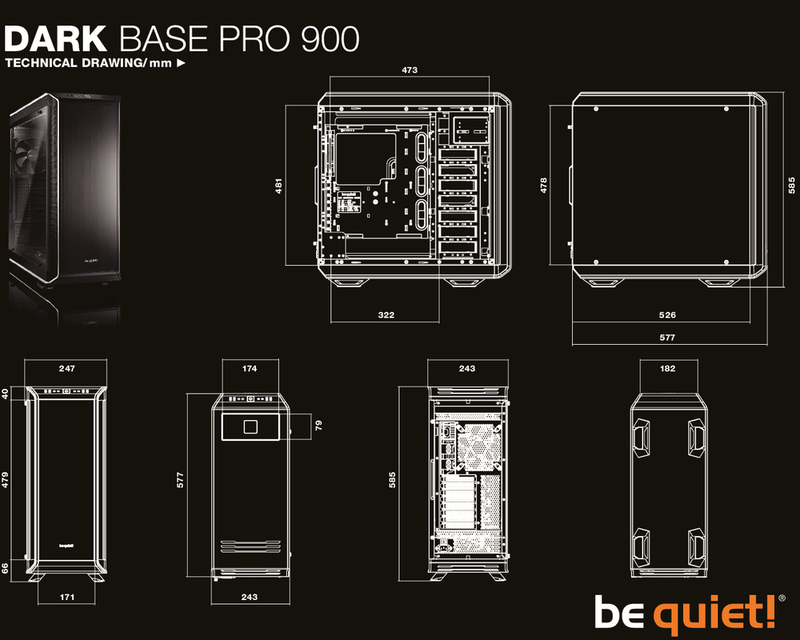 Let’s look at the outside of the Dark Base Pro 900. Starting with the top we can see the I/O cluster at the front. 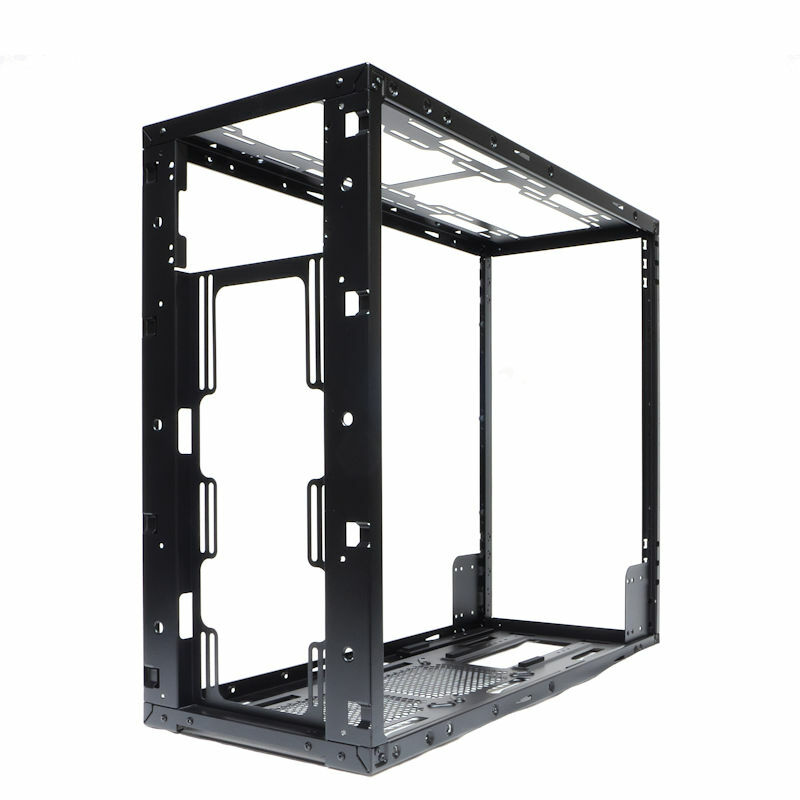 This is at a 45-degree angle so that you can get to the I/O cluster from the front or from the top, allowing you to put this case on the floor or on a desk or in a cabinet. You will find 2 USB3 ports, sockets for the microphone and the headset, the On/Off button surrounded by an on/off LED, the Reset button, the HDD activity light, and two USB2 ports. Right behind the IO is the Qi wireless recharging station. At the rear, there are vents, three on the top surface and three on the end surface. 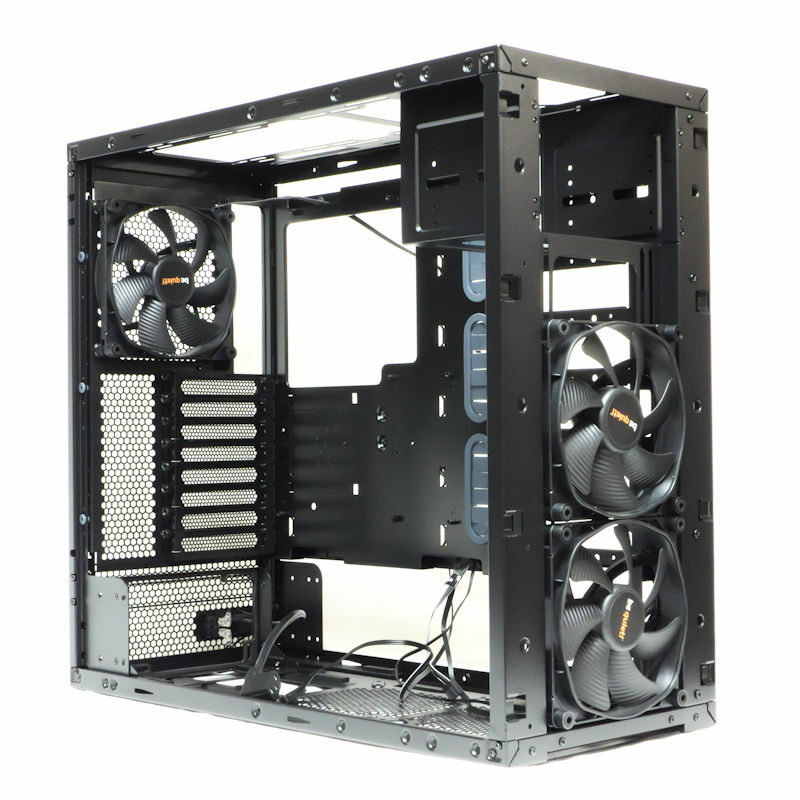 This assumes that the user will want airflow that goes front to back. The bottom is plain. The legs you see can be removed from the inside. The face panel is what we expect from Scandinavia and Germany – sleek, almost plain-looking but smooth and attractive. At the top, we can see the I/O cluster showing again its accessibility from the front. You can also see the tape holding the door shut. If you open that door you see a number of details. 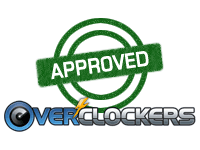 At the top, we have the slider that controls fan speed. Next to it is the button that controls the LED’s that come with the case. When you put those in the button will make them go from OFF to White/Red/Green/Blue/Gold in that order with each push of the button. 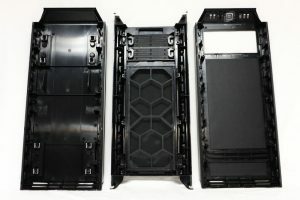 Below that are the 5.25” slot covers. As we shall see later these can easily be removed from the front. 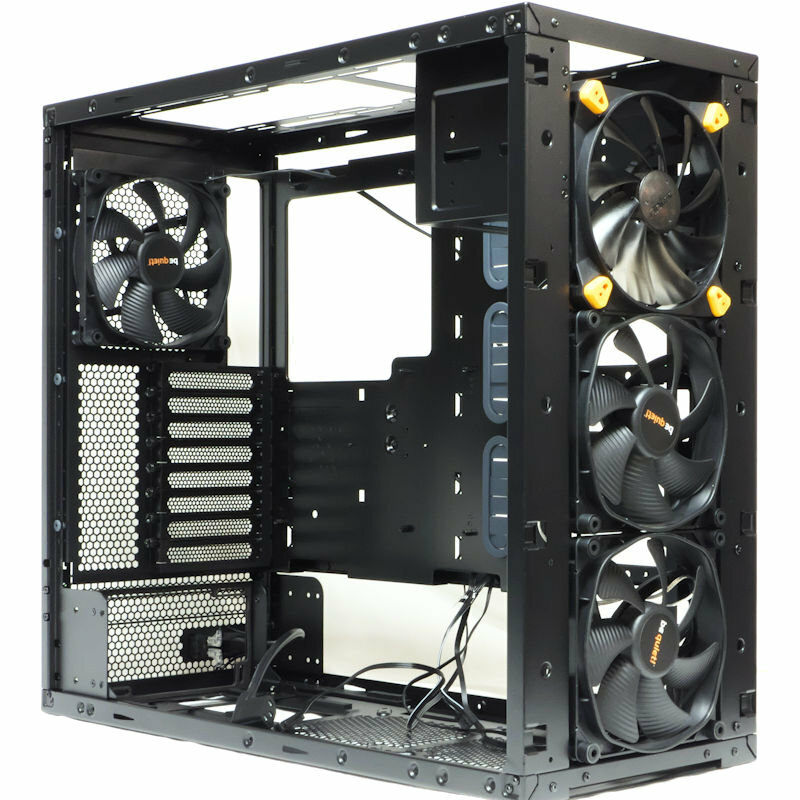 Next down is the dust filter for the two 140 mm front fans that come with this case. 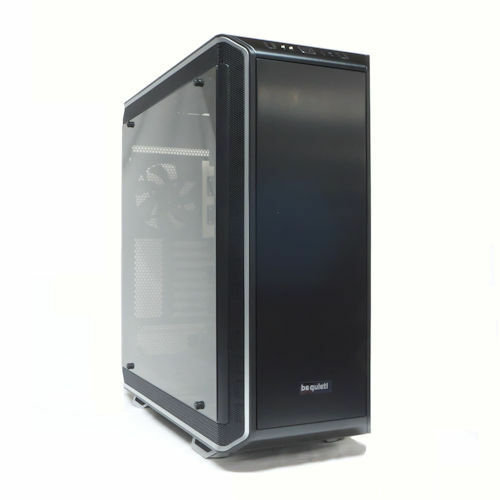 The dust filter can be dismounted from the front and washed without disturbing the case. So you could put the case in a cabinet and still clean the front intake filter. Under the front filter is a handle for the bottom intake filter. Jumping ahead to an open case, we can see the bottom filter pulled out to its whole length. You can see the meshed-over side inlets for bottom intake fans. If you will recall, the bottom surface is blank. That means you can put this case on a carpet with impunity: it will not plug up your airflow. The length and accessibility of the bottom filter is also important. This case weighs 29 to 32 lbs without computer gear inside (the variation: it weighs 29 lbs. 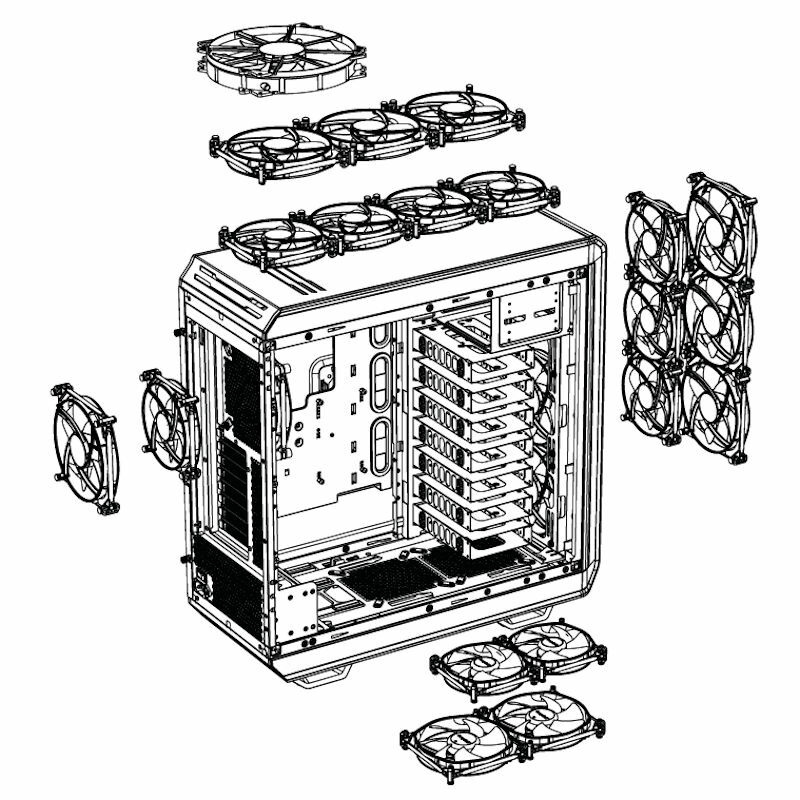 with one HDD cage, 32 lbs. with seven). It makes sense that once you put it down you will not want to move the case with its enclosed system. 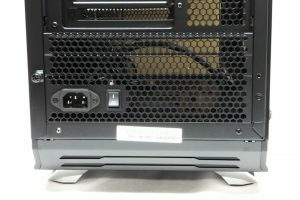 Having the bottom filter cover the whole bottom of the PSU to the front means that once you put it down you won’t have to move it. 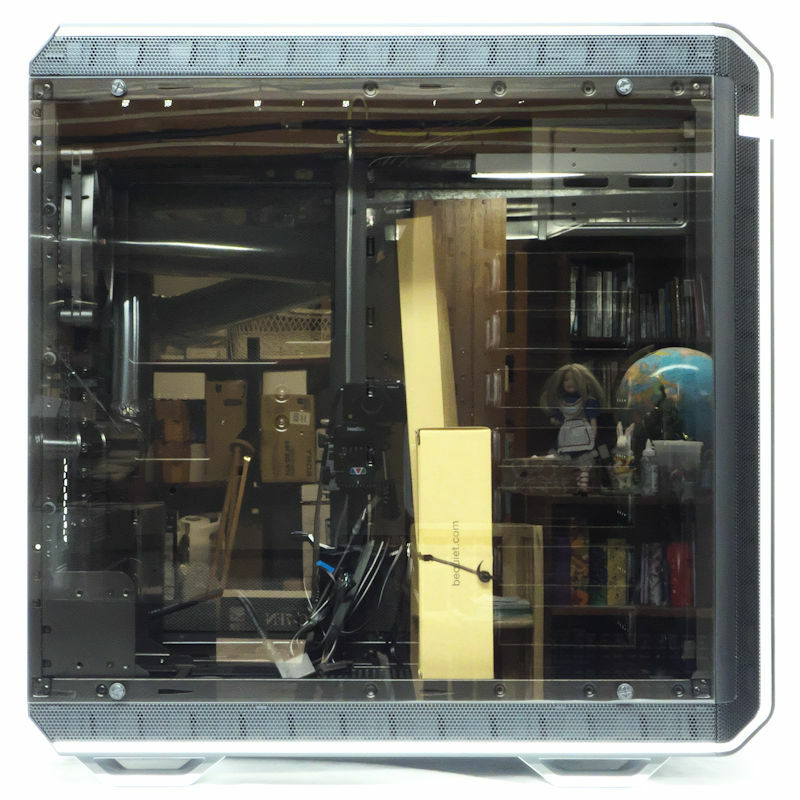 The filter is accessible from the front without moving the case which allows you to put the case in a cabinet. Item to note: like the front filter the bottom filter uses the best dust-filtering fabric I have ever used. It is true that other OEM’s use this but it shows you that it is the best. 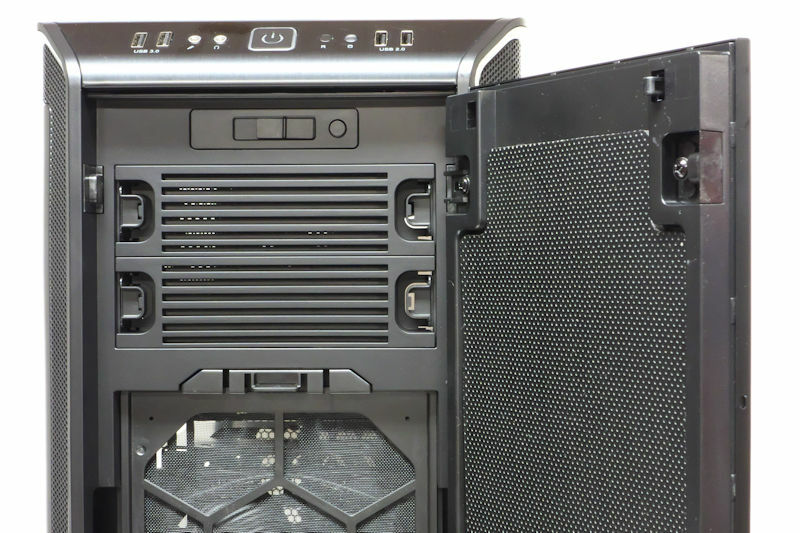 You also get a clear view of the 140 mm front fans and the sound-deadening covering on the front door. The back of the Dark Base Pro 900 is interesting. In this overall photo of the rear of this case, we can see a one-inch spacer. Under that is a third 140 mm fan. 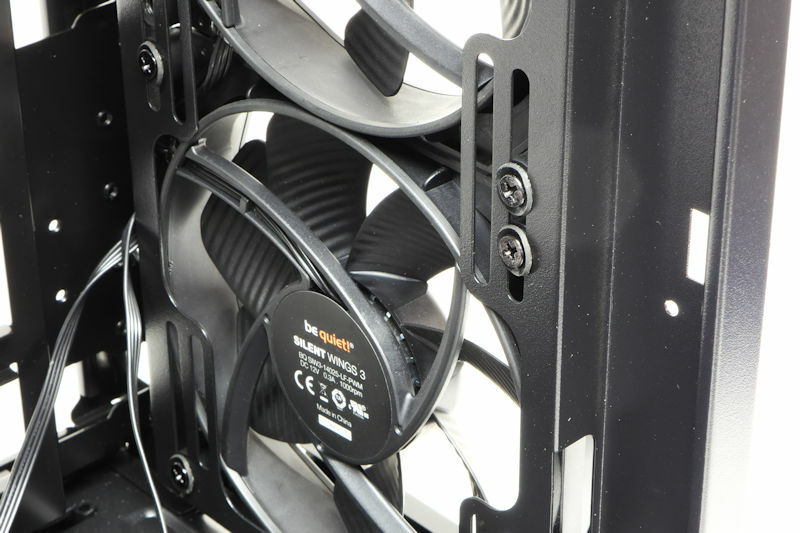 There are screw holes for a 120 mm fan, but three 140 mm fans come stock with this case, including this exhaust fan. 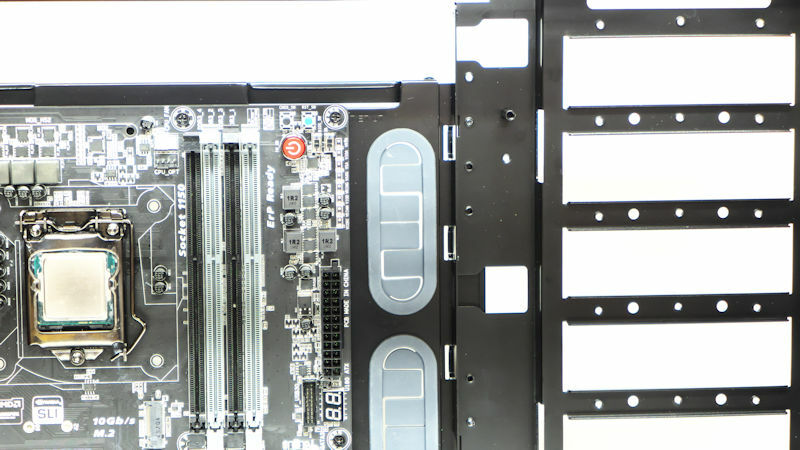 Below that we can see not seven but eight PCIe slots. 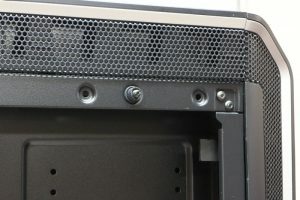 The fan, slots and the space over the slots all have that “grill” we see in steel cases. A closeup of the PSU part of the rear we can see two grilled one-inch spacers above the PSU grill. 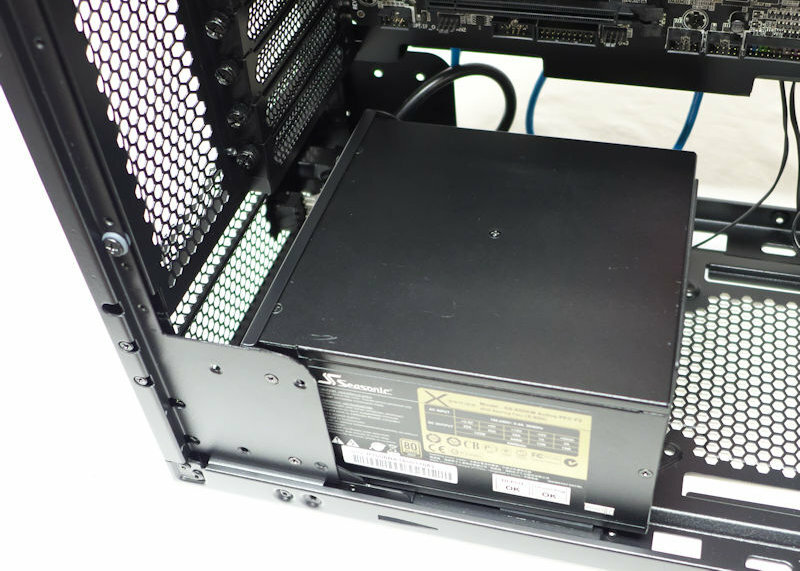 Presumably, a PSU would sit with it bottom portion submerged in the case’s framework. From this we can guess that for a PSU to breath freely it must sit forward of the grillwork of the case. Note the vents at the bottom. These presumably contribute to the PSU’s air intake. 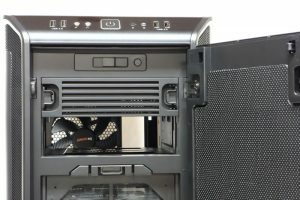 Next, we’ll return to the front of the case for a closeup of those slot covers. 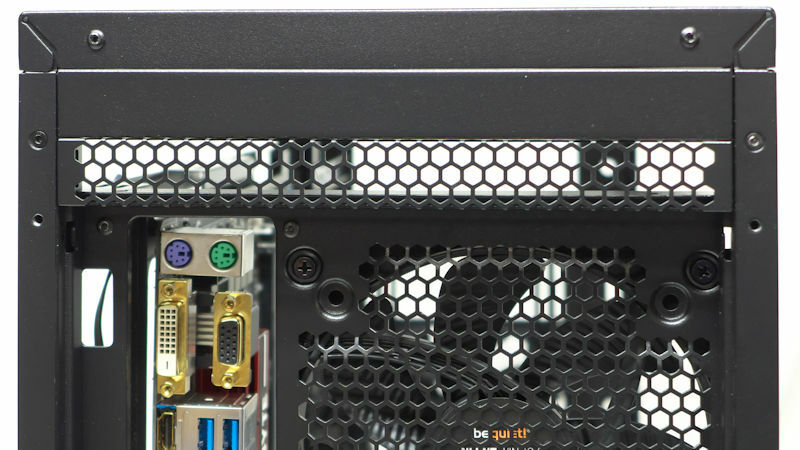 Yes, you also get a closeup of the IO cluster if that interests you. 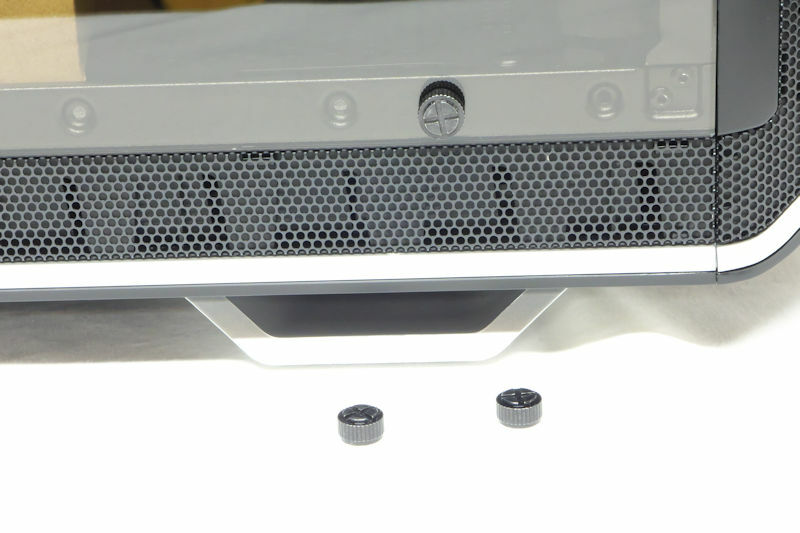 We get a closeup of the fan speed adjustment slide and the LED button too. You can also see the hardware that allows you to switch the front door from opening on its left to the opening on its right. You also get a close view of the front dust filter fabric. Good stuff. Finally, the thickness of the front sound-deadening layer probably shows best here. Reach to the ends of the slot covers and squeeze those tabs. The cover comes free from the outside and you can see into the case. Behind the 5.25” bay we see a bunch of on space closed off by the exhaust fan at the rear of the case. Finally, we get to the sides. On a plain 900, both sides are essentially blank but carry an adjustable cover for ventilation fans. We will explore details later but for now, we can look at the side and note the mesh that covers the lower air intake. Also, the thumbscrews that stick out the back are captive thumbscrews; when you loosen them they will come off with the side panel, sliding off from interior dogs. 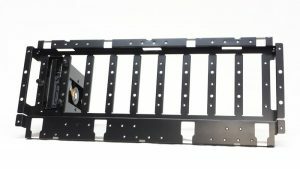 As is the case stands 23-1/2” long with the captive screws, 23” high and a little more than 9-1/2” wide. The next picture is one you have been waiting for. The side panel is a sheet of tempered glass. Oh sure, you have had windowed side panels – side panels that are steel on the periphery enclosing glass or Plexiglas windows. But this side panel is pure glass. First of all, let us attack that glass plate which covers the case. It has four screws on it. The holes in the glass allow it to be hung on four cushions, as shown in the first picture, topped by cap nuts, shown in the second picture. The slot headed thing in the middle of the cushion is a threaded shaft, which can be unscrewed. Yes, it fits in appropriately positioned screw-holes on the other side if you want to set up this computer so it goes the other way. Don’t’ lose the shaft or the cushion; there are no spares. 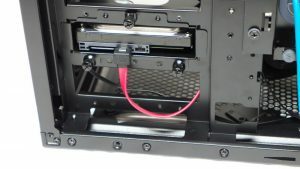 The empty screw-holes flanking the threaded rod are there to accommodate the HDD rack if you switch sides of the case. Let’s look at the glass side panel. You can’t really call it a windowed side panel; it is more a pane of tempered glass that is used as a side panel. BTW – the object propping up the pane is one of the HDD cages. The glass side panel weighs 5 lbs. 6 oz. (86 oz. = 2.4 kg). 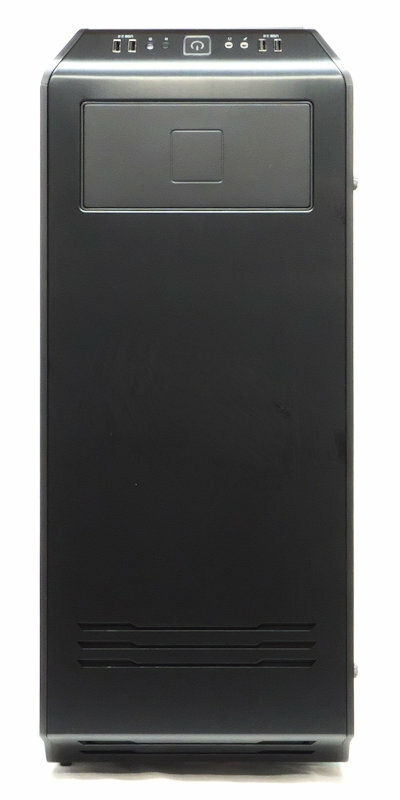 The opaque side panel has two captive screws – one on display here – to hold it on the case. 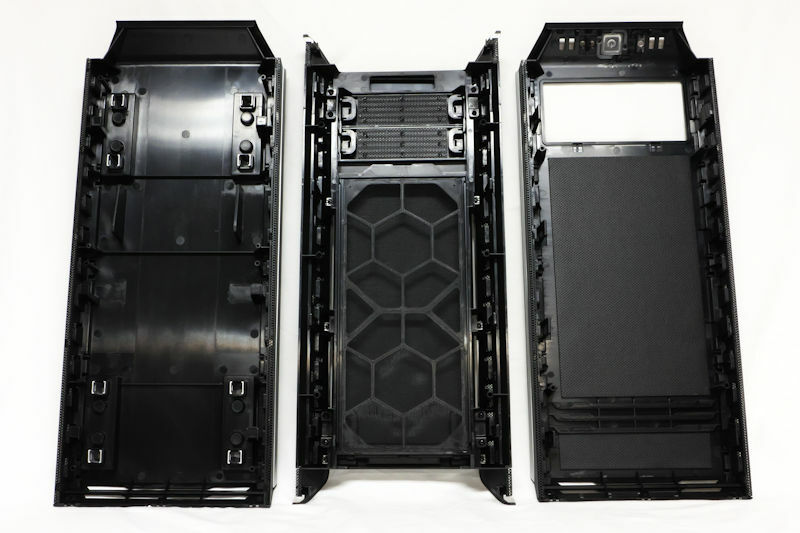 The picture shows just how thick the sound deadening layer is. The background of the next picture shows how the panel for two fans fits on the lager panel. 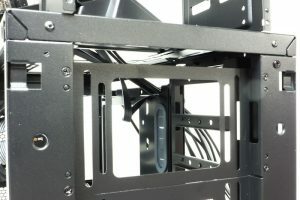 In the foreground, we can see the front end of the panel, how it fits into the front of a case with an open hinge, and the should that holds the panel up. The metal side panel weighs 4 lbs. 5 oz. (53 oz. = 1.5 kg). Here we have one of the side panel’s subpanels. You can see the adjustable lands that hold the panel at a variable distance. The next picture shows you a fake filter. This is inexcusable! 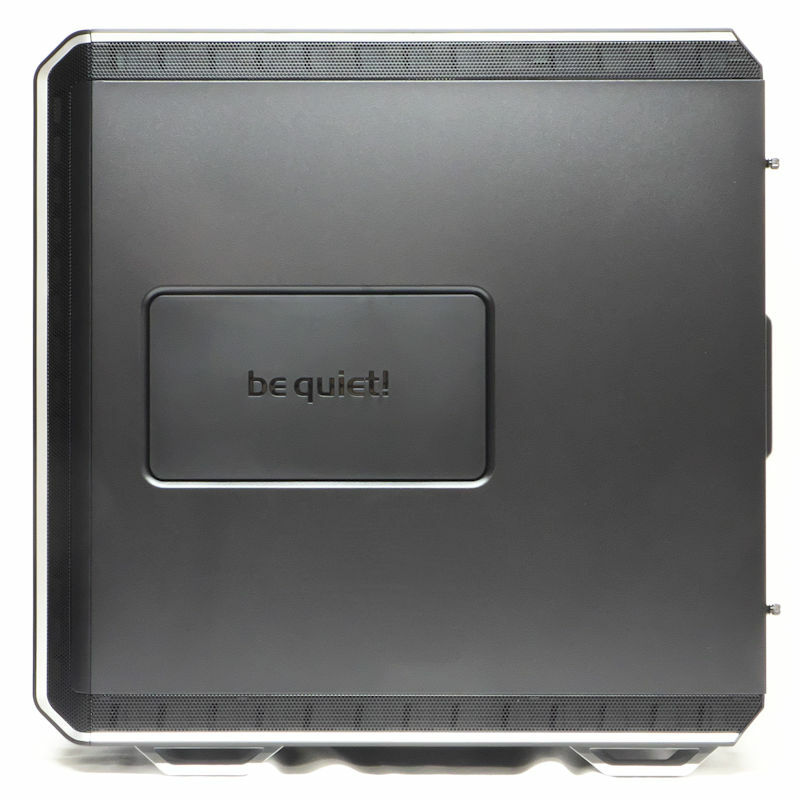 The be quiet engineers have already used the best dust filters you can get shielding the front and bottom fans. Why would they use such an egregious “filter” here (all it really does is impede airflow)? Why? I recommend that if you use side fans remove these pieces of perforated plastic, go bare if you must, or use pieces of stretched nylon hose. With “filters” like these, why would you even bother with fans? 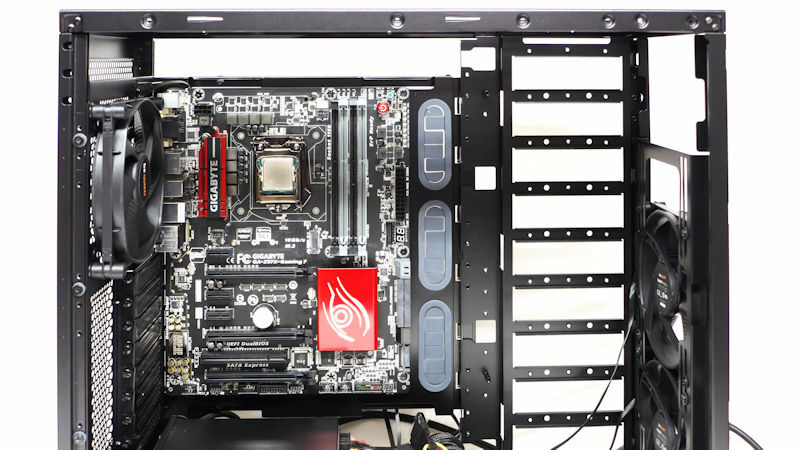 In the cavernous plenum that holds the motherboard in a normal setup, we will start at the bottom and work up. In the first picture, we see a stout cord. That leads from that socket we saw in the bottom back of the case. 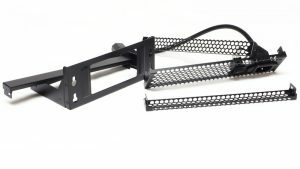 It is intended for you to mount your PSU inboard, in the movable PSU-holder you see. 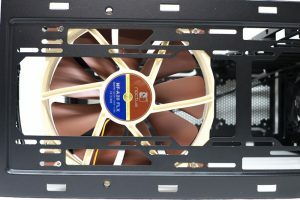 The bottom dust filter can be seen traveling under the PSU and any fans you might mount in the bottom of this case (note the excellent quality of the dust filter). 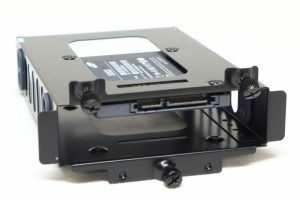 The sound-deadening layer on the far panel shows itself, along with the case wires spilling out the bottom, the 3.5” HDD holders, and the two front 140 mm fans. This space may be tall enough for an XL-ATX motherboard here. 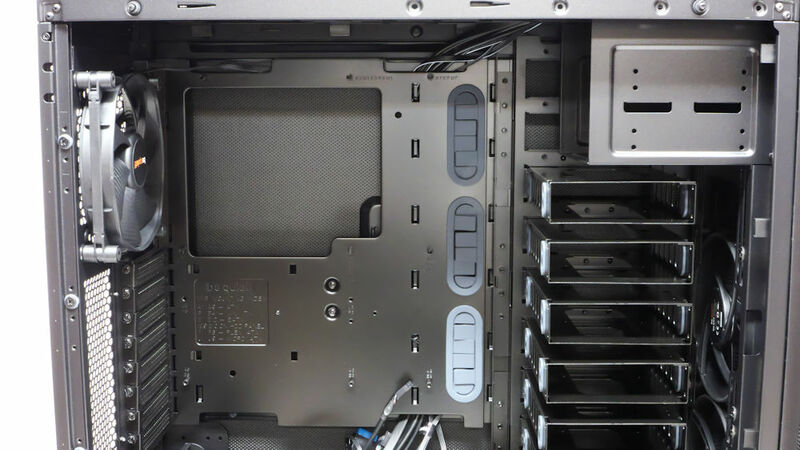 The next picture up shows the exhaust fan, the heatsink widow in the motherboard tray, the upper end of the removable HDD containers, the 5.25” ODD bay and the two front fans again. 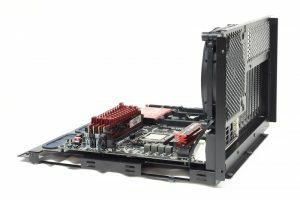 There doesn’t look to be provision for an E-ATX motherboard here. 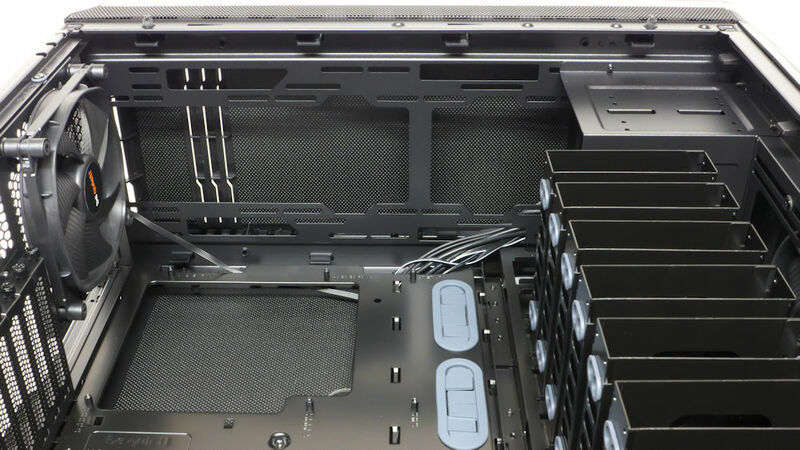 On the far right, you can see the tabs the holding the front tray to the case skeleton. 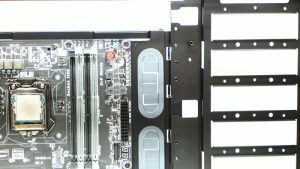 The middle spacer has a kingpin in it to allow for easier motherboard navigation. A case reviewer learns to appreciate those nice little touches. 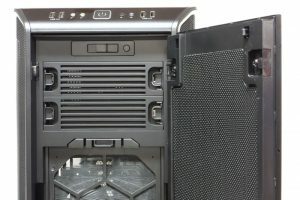 An upward view shows us that the top of this case is not impeded by unnecessary grills. 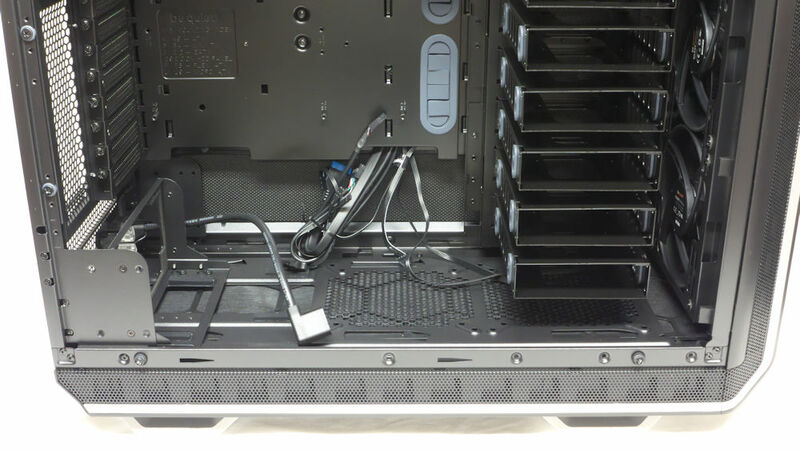 You can see the vents in the roof, and that very roof provides cover for the top of the case. It has a layer of that sound-deadening foam. More tabs, this time holding the top on. One thing I miss here is top filters. The be quiet! engineers did not anticipate that you would draw air from the top of the case to cool it, yet you might. This MB tray has cushions. How come? The motherboard tray does not touch the side. Hmm, A mystery. But the MB tray seems to be fastened to the case skeleton with sound-deadened screws, also visible here. Here we see the tabs that hold the front cover to the case skeleton. 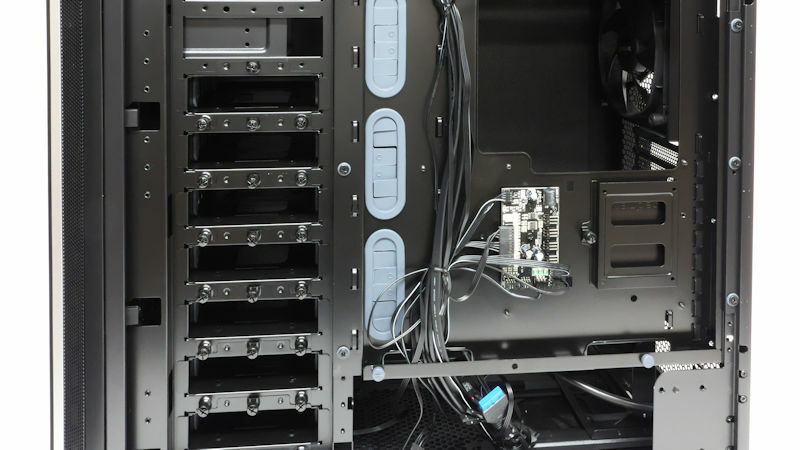 To the right are the removable HDD cages, and we see those cages are held in with thumbscrews. Through the window in the MB tray, we see . . . isn’t that the panel for the right side? What’s it doing on the left? It is there to show that this case is side agnostic. Once I removed those threaded bolts holding the glass the panel fit quite nicely on the other side. Just don’t lose those bolts for the glass– there are no spares for the shafts or the cushions. Next down we see the fan hub. It sends a PWM cable to your motherboard, where you are supposed to plug it into the main PWM header. From there it controls the speed of all four-pin (PWM) and three-pin voltage controlled fans you choose to hook up to it. The hub also controls your LED’s. 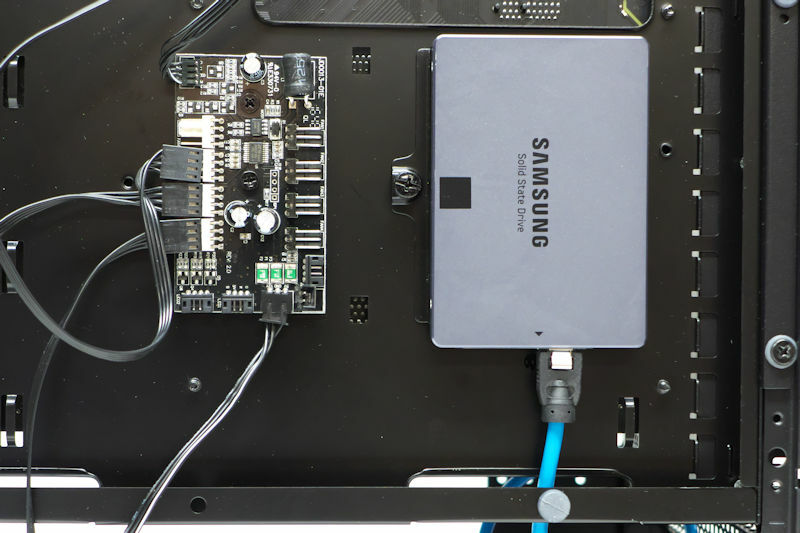 To the right of the fan hub is a carrier for an SSD. We can measure the back gap. There seems to be around 28mm back there, enough to move cables around and enough to clear an SSD. Next, we will strip off the bottom, front and top covers off the case. Here we see interior views of those covers. Here a glass-topped scale will do the honors: the covers weigh 2 lbs. 15 oz. (47 oz. = 1.3 kg) on the bottom, 2 lbs. 7 oz. (39 oz. = 1.1 kg) at the front and 2 lbs. 4 oz. (36 oz. = 1 kg) on the top. With most of its impedimenta stripped away here is the Dark Base 900 in all its glory, naked before the world. 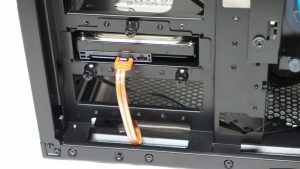 You might note that although the HDD cage holder is there and the motherboard tray is in place, nothing else is. 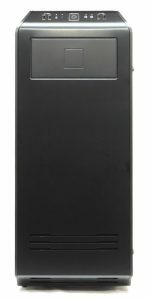 This naked case weighs just over ten pounds (160 oz. = 4.5 kg). 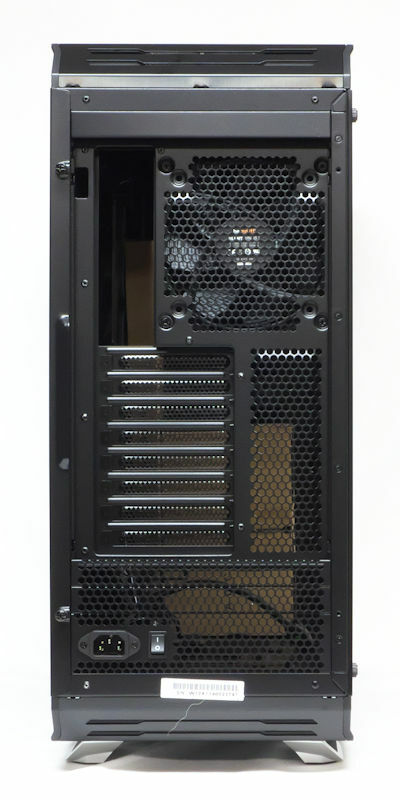 We have room for a third 140 mm fan up front, but the 5.25” cage has nothing for the upper screws of a top 140 mm fan. The be quiet! people have given us a picture of most of the Dark Base 900’s accessories. It starts in the upper left corner with a replacement for the 5.25” bay (the manual tells you how to take the ODD bay out and replace it with the “upper fan bracket”). This is what you use to fully hold a third front fan. 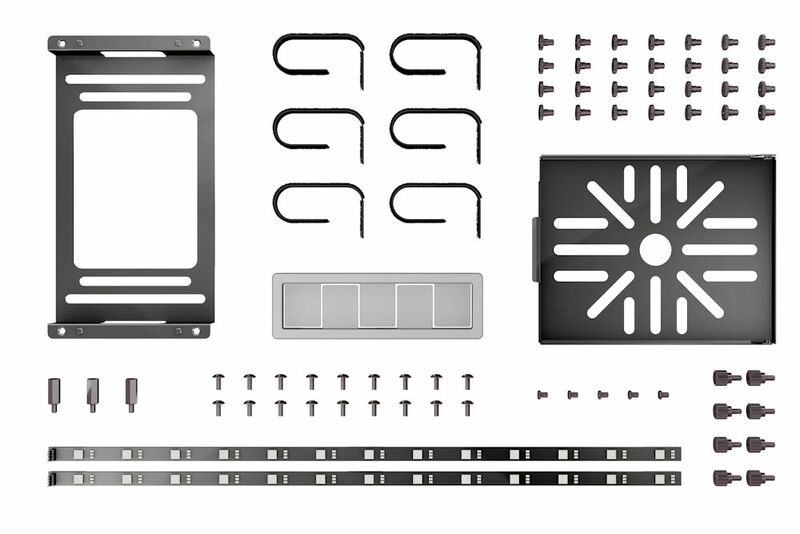 The rest of the official accessories include Velcro cable straps, mounting screws, a “WCS bracket,” three E-ATX motherboard standoffs, various screws and two LED strips. What they didn’t include in that picture were the mounting screw grommets. 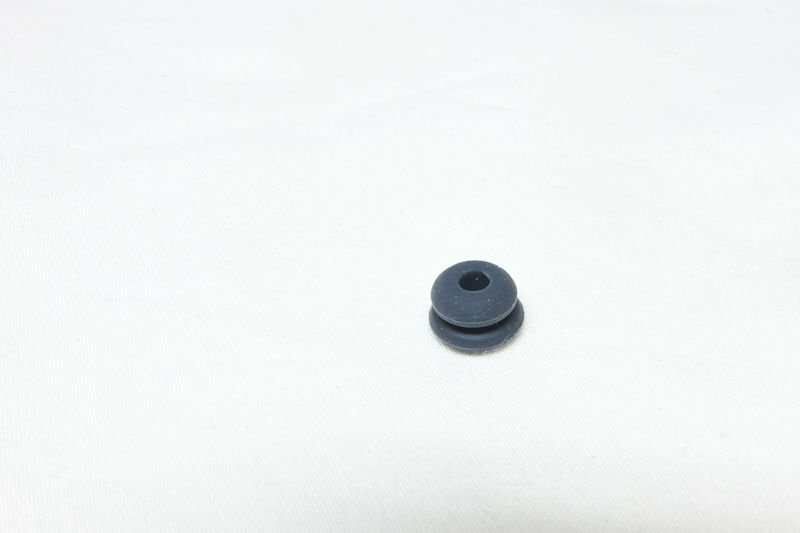 These grommets make those mounting screws work, so it is a good thing be quiet! provided extras. Here you can see those grommets in action, holding the front fans while dampening vibrations. 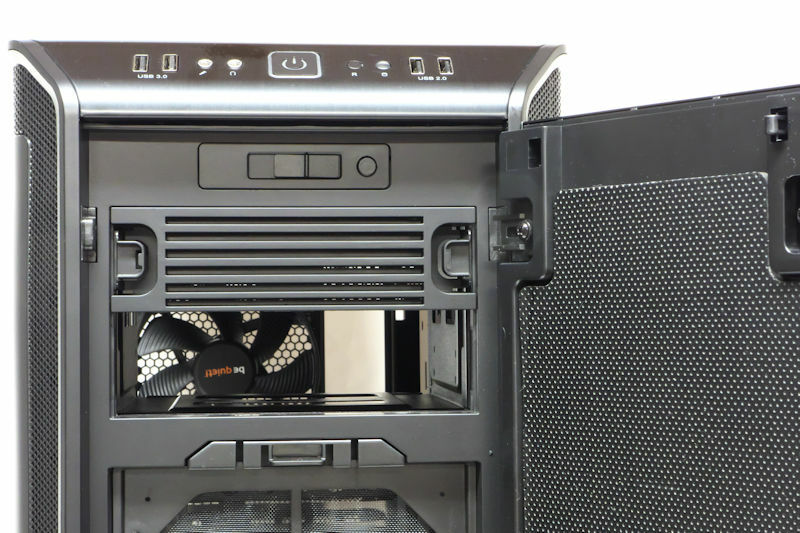 Slots allow those fans to slide up and down or allow you to put a rad here. 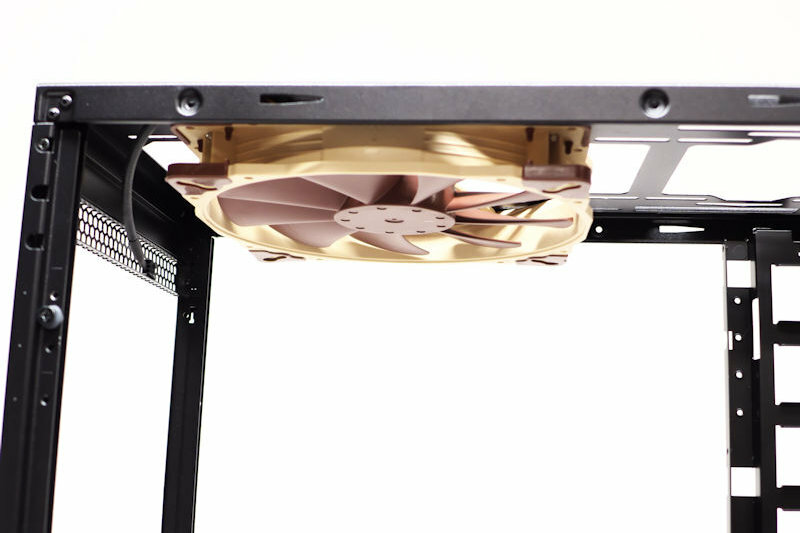 You can also see narrower slots for 120 mm fans. This is a front fan bracket that was installed in place of a 5.25” bay unit. You can see how it nicely complements the fan holders beneath it. 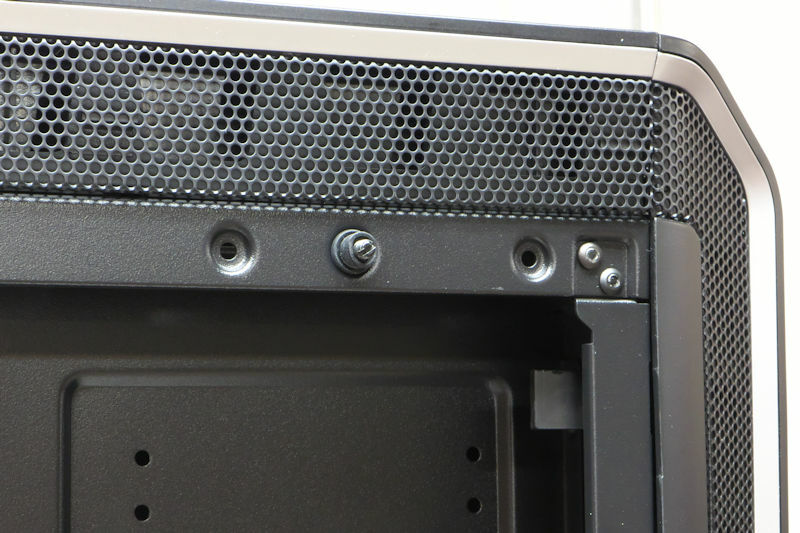 We’ll just unscrew those mounting screws with their sound-deadening grommets. And what do you know? The motherboard comes out. At the bottom of the MB tray, you can see a cable. 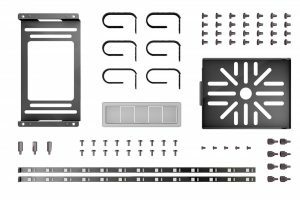 That leads from a motherboard’s PWM header to that fan controller you saw on the bottom of this tray. But now we know what those cushions were for: they support the MB tray when it sits outside the case. The be quiet! engineers suggest that you can use this tray as a test stand. But why would you buy this huge case just for that? I’ll bet they would sell you the MB tray alone if you ask nicely. Now we can see the raw skeleton of the Dark Base 900. It weighs all of 7 lbs. (112 oz. = 3.2 kg). Given that the original case was 29 lbs. making the skeleton out of aluminum would be a false economy. Probably now is a good time to mention the be quiet! manual for the Dark Base Pro 900. It can be downloaded here in pdf format, but you can take the paper version anywhere. The manual is in six languages, starting with English. Multilingual pictorial directions start at page 52 and continue through page 74. It is a very thorough manual. The only complaint I have is that the multilingual directions are rather cryptic (“Remove” this and “Secure” that). For the online version, the engineers could afford a little more expansive language IMO. In their manual be quiet! tells you what kind of air cooling and water cooling will fit inside the Dark Base 900. It’s basically anything you can think of. What they don’t tell you about is how well everything fits together. Probably the first rule you learned about when working with sheet metal was to fasten everything loosely until all the screws are in, then tighten them. Here, the be quiet! engineers spoil us. In most areas the holes are so well-aligned that our First Rule is no longer necessary: we can usually tighten screws as we come to them. We’ll start off by mounting a motherboard on the tray. Then we’ll mount the motherboard tray in the case. 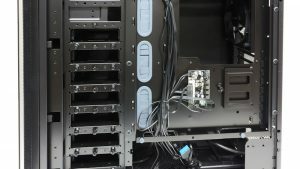 I put in a couple of HDD cages too show you how it looks. You can see them to the right of the MB. Speaking of HD containers let’s look at one with an HD in it. Those slots should provide adequate ventilation. The next picture shows an SSD in a 3.5” cage, thus confirming the boast that you could put 15 SSD’s in this beast (seven 3.5” cages and one 2.5” carrier). Let’s look at those HDD cages in action. One problem we have seen with HDD cages is their placement too near the side of a case – you cannot use straight cables; you must use angled cables. Another problem is that in some cases you cannot use angled USB cables for one reason or another. 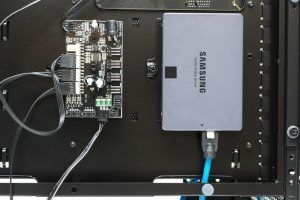 In the first picture, we see that a hard drive is located far enough inboard that the USB cable can make the turn, allowing one to use straight cables with the hard drive. 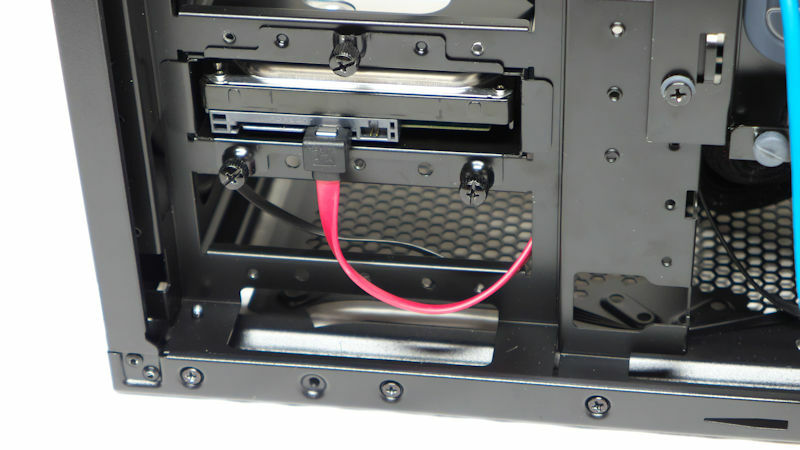 Next, we can see that the HD is mounted close enough to the edge of its cage that you can use angled USB cables. 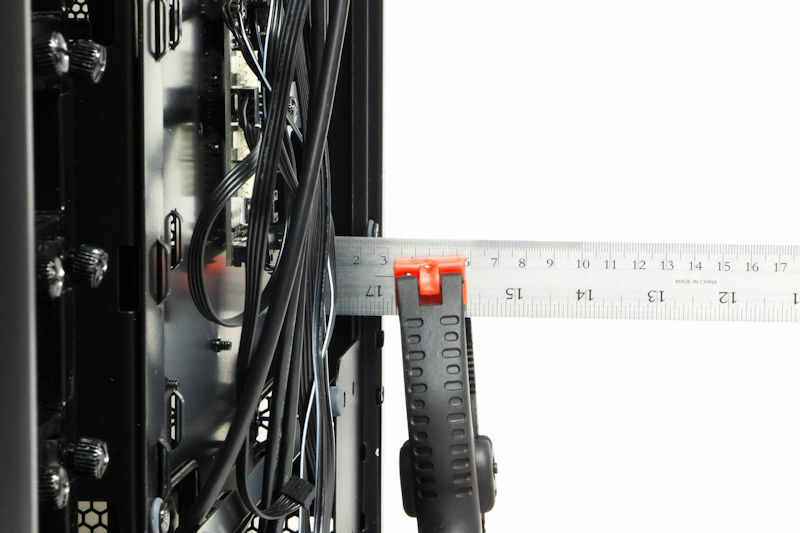 So now we see that this case allows us to use all our USB cables, straight or angled. 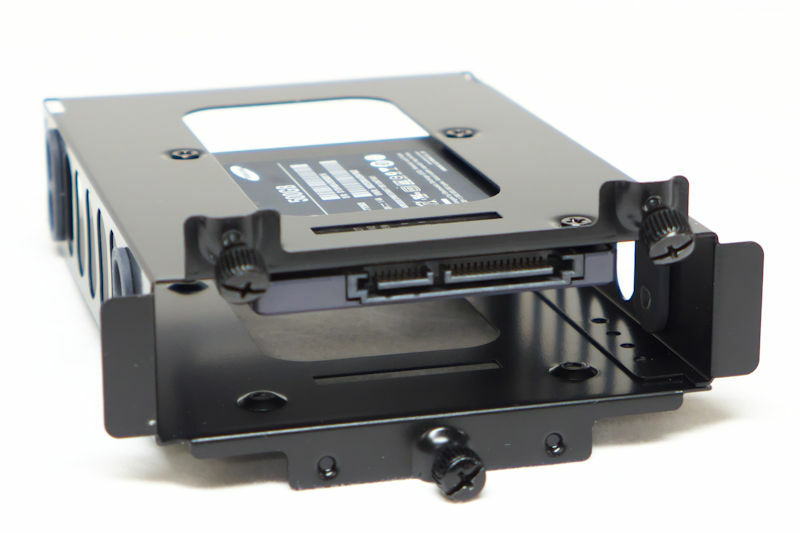 An HDD cage weighs 209 grams (7.3 oz. or about a half-pound). 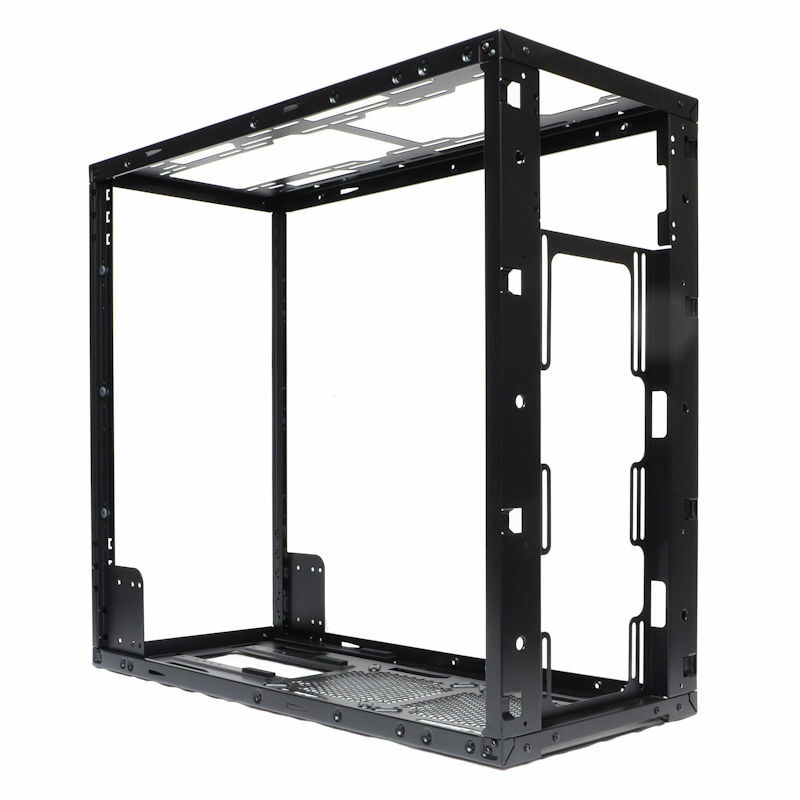 Now we will move on to the HDD cage rack itself. It can be removed. 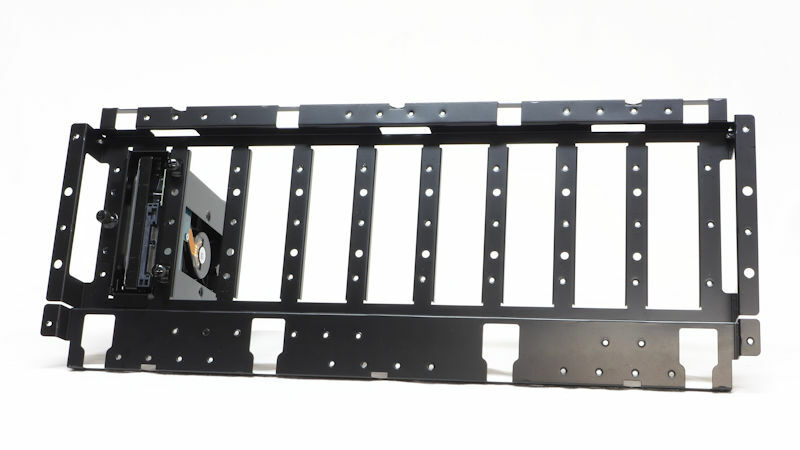 The rack is asymmetric so it can be turned upside down with more blank metal next to the motherboard. It can also be mounted on the other side of the case. This is probably a good time to introduce one of be quiet’s special accommodations to water coolers. There is a “mounting spot for water pumps and the like.” It is called an LCS bracket and it has 16 slots in it. It was made to fit onto the top of an HD cage. 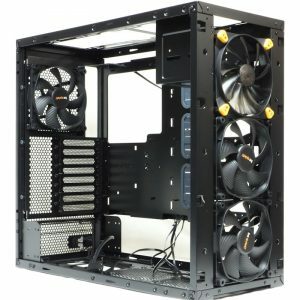 How many fans will the top of this case fit? 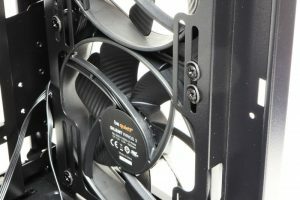 The first picture shows three 140 mm fans, the second four 120 mm fans. How about a 180 mm fan? The case was advertised to hold them. But alas, I have given mine away so I cannot show you. How about 200 mm fans? Here is one. See the slots in the top? That tells you that rads should fit up there too. 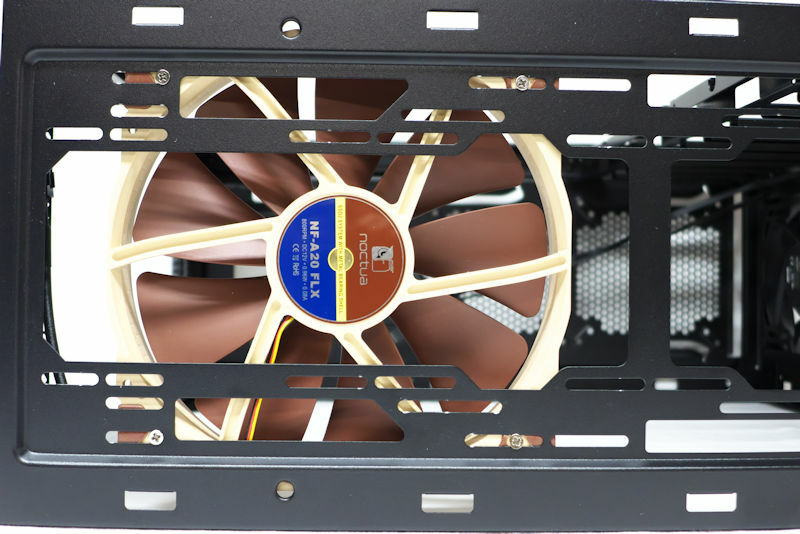 Seen from the side the 200×30 mm fan looks nice. 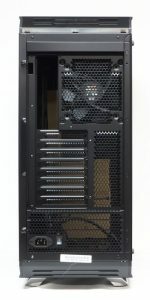 But slide it to the right and the top of the HDD rack cuts into it: you have room for only one 200×30 mm fan. 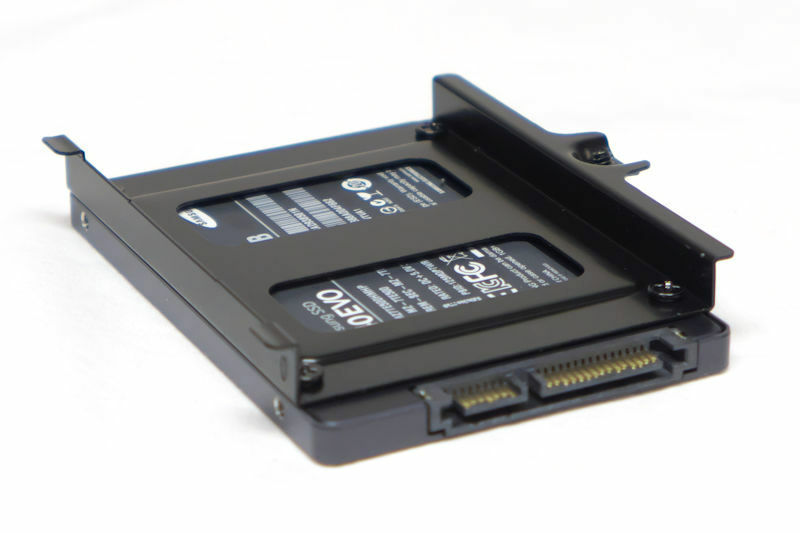 The SSD carrier is attached to the SSD with screws. But notice the captive thumbscrew. 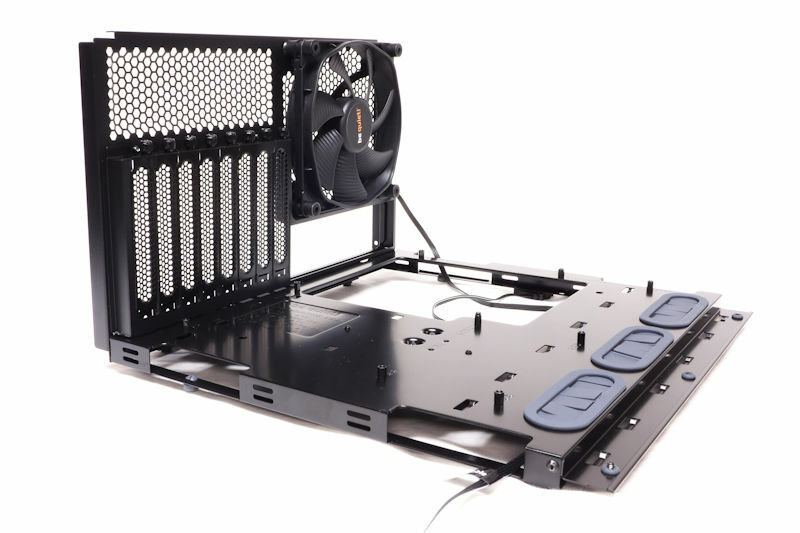 With it, the carrier mounts to the back of the MB tray alongside the fan hub. The PSU goes in a PSU carrier. The carrier fits nicely in the case but it fits with side screws. 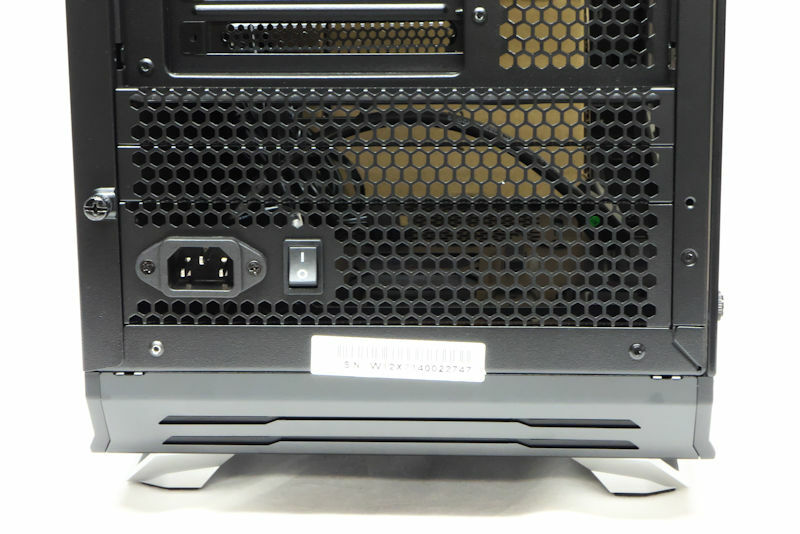 There are bottom screw holes but you have to fasten them before the PSU goes in its carrier. What to do? 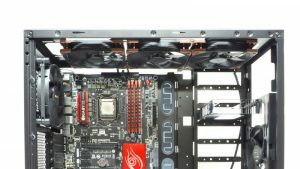 Well, you can remove the spacers behind the PSU, screw in the PSU and put back the spacers. BTW – the case does not come with PSU screws. You will have to use the screws that came with your PSU. 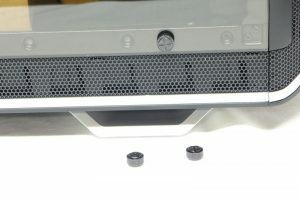 Here are the end pieces from the rear or the case. The solid piece comes from above the exhaust fan. The large piece is the PSU carrier face down, showing its bottom screw-holes. Next, we see the top aft end of the case. One of our grill pieces is there. 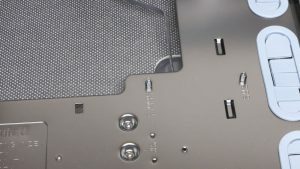 It turns out there are screw-holes up and down the side of the case allowing you several inches of play in the vertical position of your motherboard tray. Note: those 1” spacers are held in by special screws. There are no extras. I lost two of mine when I was replacing these spacers. I salvaged one but the other is hidden in a part of the case that is closed off. I learned to turn the case on its side so the special screws go down vertically — I would not lose anymore. 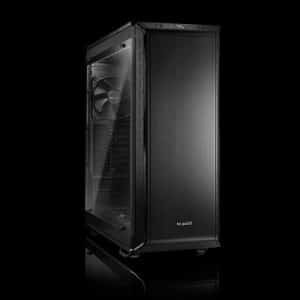 But for such an expensive case you would think that the be quiet! engineers would have included spares. 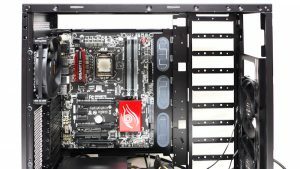 Now, why would you want to vertically reposition your motherboard? Perhaps if you are using an E-ATX motherboard. 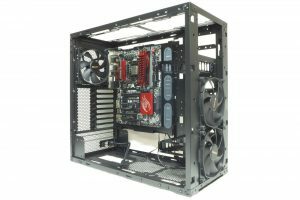 Remember that there did not seem to be room for a wider MB than the ATX? 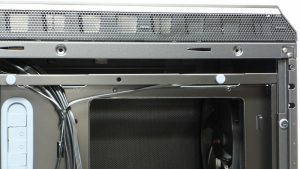 Well, the HDD rack is asymmetric. 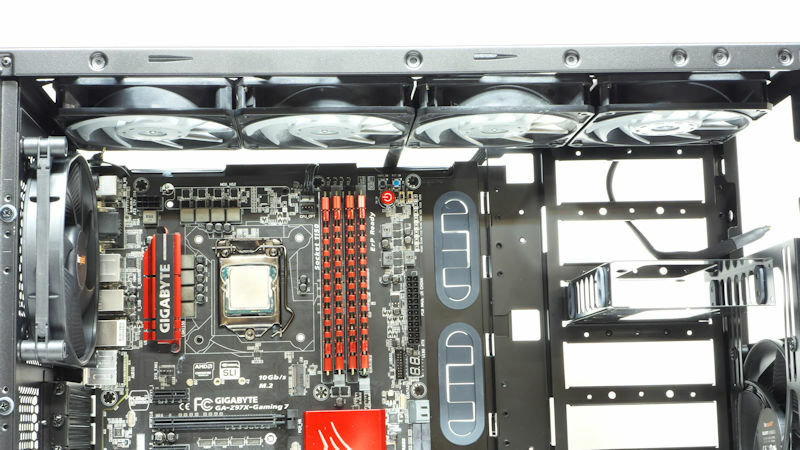 You can flip it around (the manual shows how) to accommodate E-ATX motherboards. But you have to drop the MB tray by an inch to line up the screw holes. 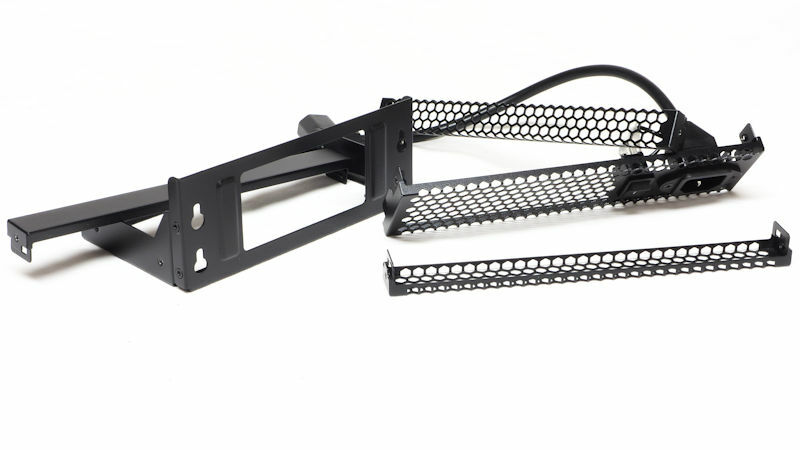 Three longer MB spacers are supplied to handle an E-ATX MB, but there are no extras, so don’t lose any. Now for the inverse ATX arrangement. 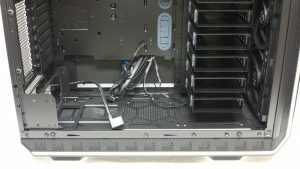 First, we flip the HDD rack to the other side to make a place for the MB tray. 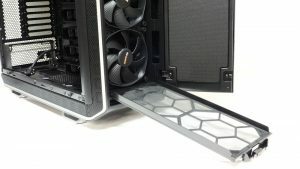 As we can see in the first picture the MB tray then fits easily on the other side of the case with the window down and fan hub up. Seen from the motherboard side the Dark Base 900 looks like it was an inverse ATX case from the start. 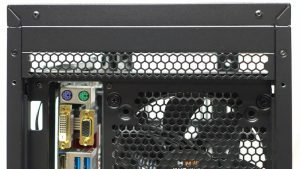 At Amazon the Dark Base 900 is $178.39 and the Dark Base Pro 900 (the one reviewed here) is $238.86 to $249.99. 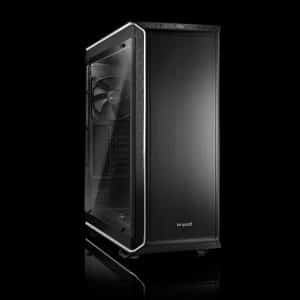 At Newegg the Dark Base 900 is $199.90 and the Dark Base Pro 900 (the one reviewed here) is $249.99. 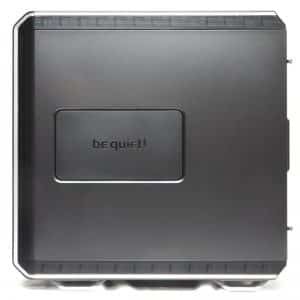 The case reviewed was sent by be quiet! Thank you very much. As you can see, even the non-Pro version of this case is expensive; but both versions earn their keep. 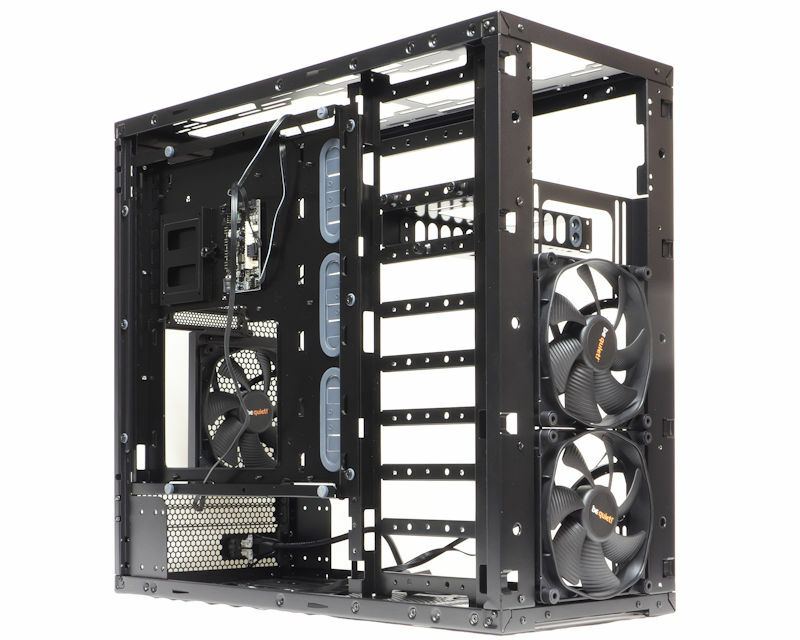 They are fine cases that can accommodate the best heatsinks and didn’t forget about water cooling. 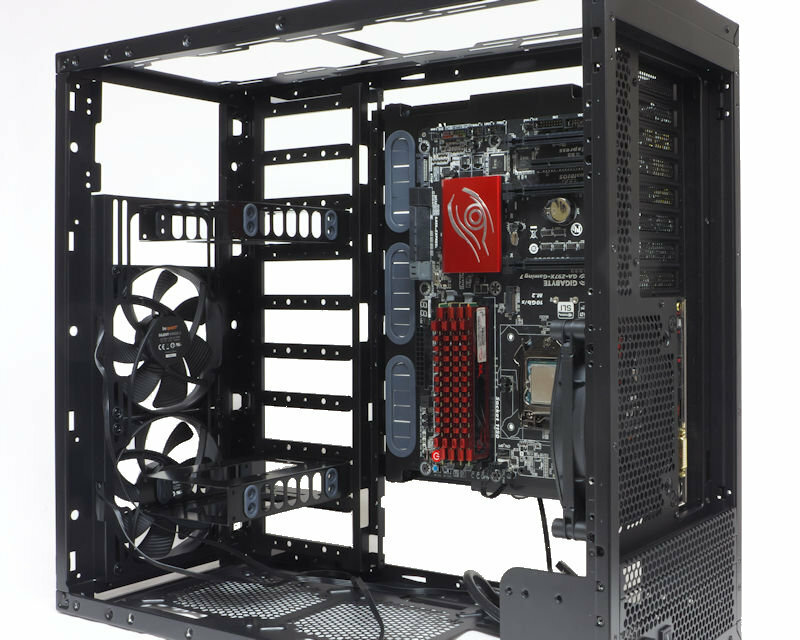 The glass side and the LED’s show off your system to perfection. 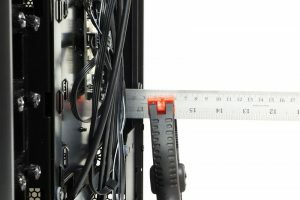 The first thing that I noticed about this case was the weight. Luckily an assistant was around to help. I tried as I took the case apart to find out where the weight came from. I learned that the weight comes from the various parts that make up the case. When we get down to the skeleton it seems to weigh almost nothing. There is nothing to convert from steel to aluminum to save weight. And then there is the weight of the computer system that goes inside. Add to that the weight of a water cooled parts, it adds up! It came as a happy surprise to me be quiet! 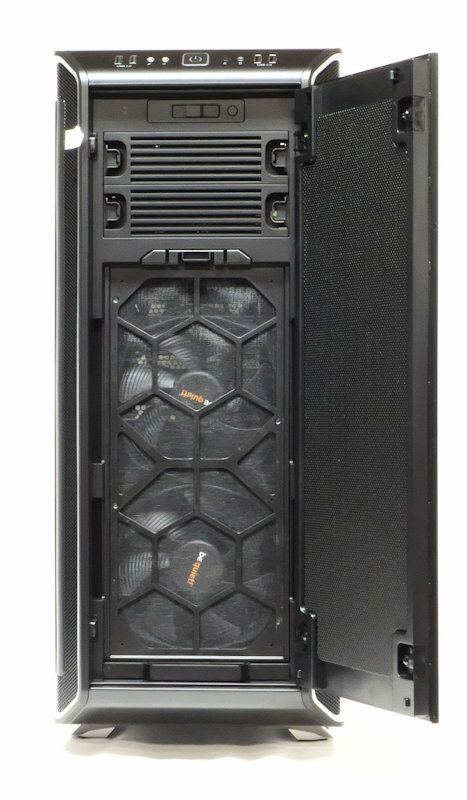 equipped the Dark Base 900 with a removable bottom filter. 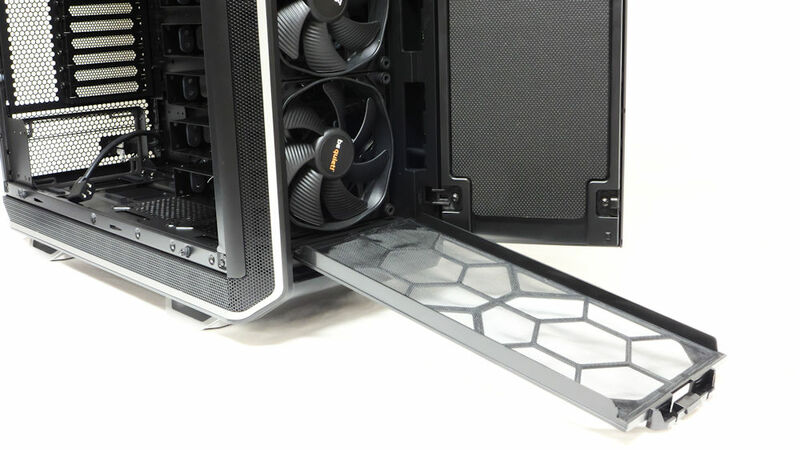 It covers the entire length so you don’t have to move the case to clean the dust filters. Better yet, the case is protected on the bottom so it cna be placed on a rug and can move it out to blow dust from the innards. Of course, if you choose you can leave the feet on the bottom and leave the case in place. As with any case, this Dark Base 900 is not perfect. The manual is quite intricate, with instructions on doing lots of things. But the online version could be a little more detailed than our paper version. Also, I would like to have seen included spares of their unique fasteners. 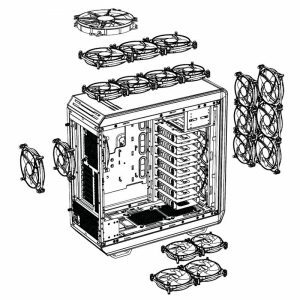 And there is the possibility a user might want to use top-down air-cooling. 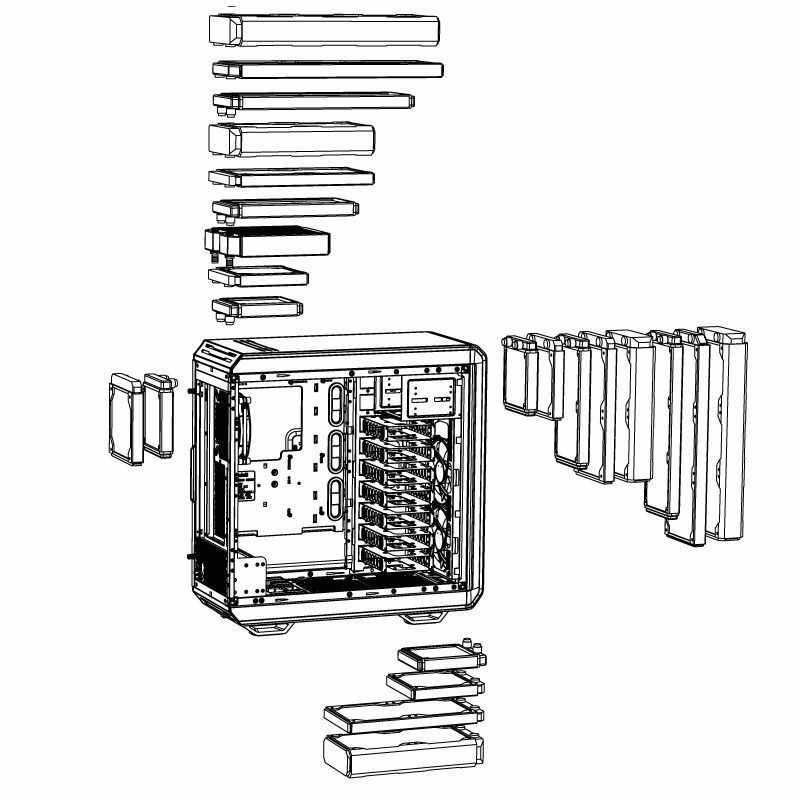 As the case is constructed the user would not have a dust filter in with that specific configuration. 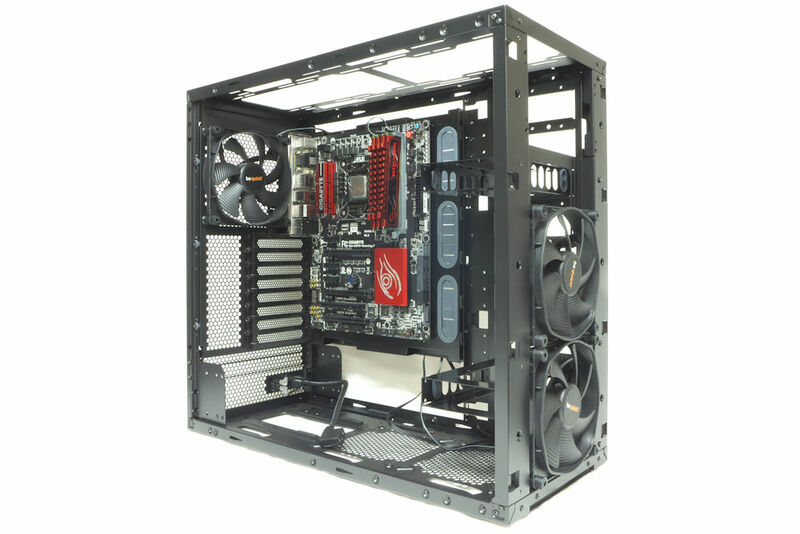 But overall the design was well thought out and can accommodate about any system you want to build. The be quiet! engineers continue to use fake filters in the side panel. Such a “filter” is uncalled-for in a high-end case like this one. But the designers should be given kudos for not including front and top “grills” where they were absolutely not needed. The case was well put-together. The screw-holes were right where you wanted them to be. 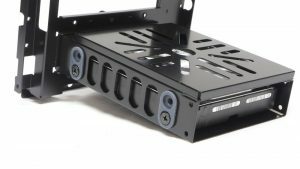 In fact, the first rule of sheet metal work (fasten everything loosely until all the screws are in and only then tighten them) is no longer necessary in most parts of this case. Truly premium construction. There are screws everywhere, and every screw has a purpose. Every screw can be unscrewed and you can move something around in this case when you do so. We are talking about a tinkerer’s delight here. If you enjoy messing with things this case is for you. If you don’t like messing with things this case can be used as-is straight from the box, so it is still for you. Wow nice case indeed! Not too happy about the poor ventilation if you decide to go water, especially for the pricetag it fetches. Still a nice case for silent operation. Thanks Ed. This case seems like a joy to work inside. Like you said, a tinkerer's dream. BeQUiet are really top notch! From PSU's to cases and fans. MIght go with this one in a near future. Don't forget the 600 and the 800. Do look at those reviews. This case is very heavy -- if you need it, it's grand. But if you want a less-heavy option look at the other cases. I believe be quiet! sells glass sidewalls for all their cases.